The Westmont High School Robotics team was founded in 2010. Since then, the team has grown in size and accomplishments. Originally the team’s name was W.R.A.T.H., which stands for Westmont Robotics Association of Tech Heads. 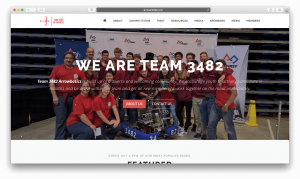 In 2013, the team decided to rename themselves Westmont’s Arrowbotics, which is more fitting with the Westmont Warriors theme of the school. Founded in 2010, the team began as a small part of the Westmont community. The team went to the competition MadTown ThrowDown with Prospect High and our community has grown significantly since. Now boasting 30 members, Arrowbotics is a significant part of the Westmont atmosphere and we are proud to be part of such a great community. Westmont Arrowbotics is structured with several divisions and leadership positions. Each division including the board, electronics team, mechanical team, programming team, public relations team, CAD team, and mentors are all vital to keeping our team running. Team 3482 does not only compete in FRC we want to be active parts of our community, involved in helping people of all ages to learn basic robotic skills. We have engaged our community by attending events including in Discovery Charter School, Westgate Mall, and the robotics Block Party. 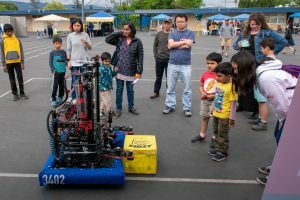 Many people considering joining robotics have several questions regarding how we run and how we encourage participation. For those who want to see common questions we receive as a team we developed a FAQ page. Over the past several years our website has received several makeovers and content updates to maintain our high standards of quality at our team. We have developed a complete page with blurbs about our website history and snapshots of how we have changed. Despite all of the resources we provide on our website to answer any questions one may have, we have developed a contact form to get in touch with us for any reason necessary, whether to contact us about sponsorships or to answer any questions about our team.